GayLawNet: Saudi Arabia – Information on legislation, policies, and relevant cases in Saudi Arabia regarding discrimination and LGBTQ issues. 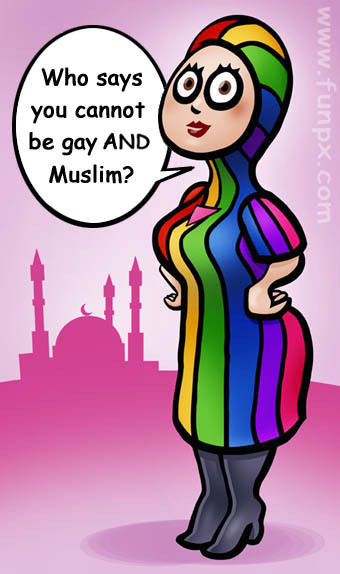 Muslim Gay Girl. Blog written by a gay Muslim girl. Contains articles and comments about being a queer Muslim individual. Muslim Alliance for Sexual and Gender Diversity. Information about the group that organizes the LGBT Muslim retreat that takes place in Philadelphia, PA.
Muslim leaders struggle to advise gay youth. Tradition fails to offer guidance, and science can’t help either. Muslim leaders are beginning to change their views regarding homosexuality and Islam, realizing that sexual orientation is not something that can be “prayed away” and changed. (August 18, 2012, Edmonton Journal). Islam and Sexual Minorities. Pinterest page with a variety of other resources.